There has been in the past decade a significantly growing interest in the use of flow-induced lift forces for a passive control of particle motion in microchannels. 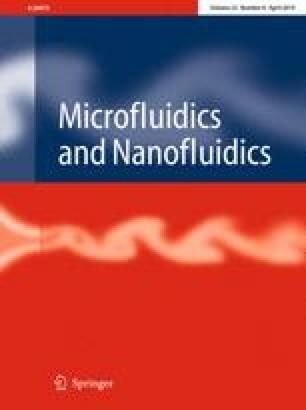 This nonlinear microfluidic technique can be implemented in both Newtonian and non-Newtonian fluids. The motions of rigid particles in confined flows of viscoelastic fluids with and without shear-thinning effects have each been well studied in the literature. However, a comprehensive understanding of particle motion in inelastic shear-thinning fluids is still lacking. We present herein a systematic experimental study of the motion of rigid particles in the Poiseuille flow of pseudoplastic xanthan gum (XG) solutions through straight rectangular microchannels. We find that the number and location of particle equilibrium positions are both a strong function of channel dimension, particle size and XG concentration. We attempt to explain the experimental observations using the competition of inertial and elastic lift forces acting on particles. Our experimental results imply a potentially high throughput separation of rigid particles by size in XG solutions. This work was supported in part by NSF under Grant No. CBET-1704379.